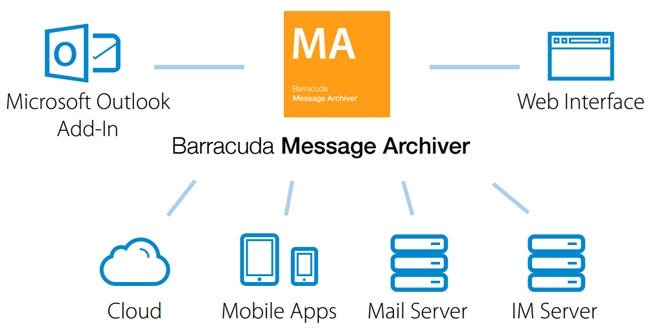 The Barracuda Message Archiver is ideal for organizations looking to reduce their email storage requirements and boost user productivity with mobile or desktop access to any message ever sent or received. The Barracuda Message Archiver also provides a powerful, yet simple platform for eDiscovery and compliance - all delivered as a virtual appliance so you can deploy into Amazon Web Services without requiring additional hardware. The cloud-connected Barracuda Message Archiver uses the Barracuda Cloud to move or copy data to the cloud. Setting policies in “mirror” mode replicates all data to the cloud for disaster recovery purposes. Setting the policy to “Rotate” mode allows the appliance to scale-up and use the cloud as a secondary tier of storage. Users treat mailboxes as filing cabinets, driving expensive server storage to expand continually. They respond to storage limits by archiving messages locally with PSTs, which are not managed (or even seen) by IT. The Barracuda Message Archiver dramatically reduces demand for email server storage through attachment stubbing, message/ attachment deduplicaton, and compression, while also eliminating the need for PSTs. The Barracuda Message Archiver's indexed archive supports extensive search, auditing/ permissions, legal hold, and export helping facilitate eDiscovery and retention. An intuitive interface and powerful feature set shortens response time to ensure messages are found easily when needed. Federated search lets users search across appliances and cloud-based data even when email services are unavailable. Users can search and retrieve archived messages anywhere, anytime.